The civil war left a lasting impact on the United States of America, arguably more than any other event in our country’s history. According to government statistics, it was also the most traumatic experience endured by any generation of Americans. At least 620,000 soldiers lost their lives in the war, 2 percent of the American population in 1861. This fighting was not done in vain, however, and the victory of the Union led to the emancipation proclamation, the rise of industrialism, and a somewhat clearer definition of the rights guaranteed to every American citizen. The war is also responsible for one other aspect of our society that now blends in with our modern environment: blue police uniforms. Early law enforcement and police activity were largely performed by volunteer watchmen as well as elected or appointed constables and sheriffs. In fact, centralized, municipally-managed police departments were unknown in the United States prior to the 1830s. The men who did get elected earned a living through the fee system for the warrants they served and at the time most likely wore whatever was comfortable. There was certainly no standardized uniform and while the concept had been introduced in the United Kingdom in the late 1820s, U.S. policemen in the mid-1800s actually rejected the idea because they thought they’d be the center of public ridicule. 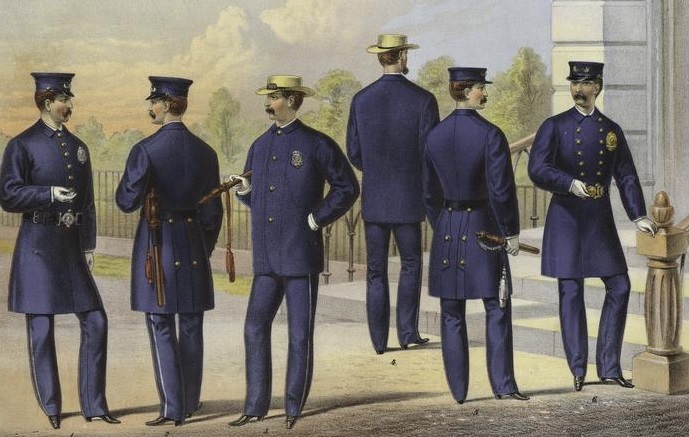 With that said, the New York City Police Department became the United States’ first municipal police force to issue uniforms to its officers in 1854. The NYPD was followed, in 1858, by Boston, Chicago, and soon thereafter, other cities. The use of uniforms didn’t take place all at once, but the adoption did eventually fan out across the country. The uniform also kept evolving. In the late 1970s, the police department in Menlo Park, California moved away from typical police uniforms, opting instead for a dress style designed to better emulate civilian fashion trends and communicate a “softer” appearance. The updated uniforms included green blazers, black slacks, a white shirt, black necktie, and weapons concealed under their coats. In some psychological tests, it was discovered police – after using the new uniform – displayed less authoritarian personality characteristics. Simultaneously, civilians and suspects injured during arrests by police dropped by 50-percent and assaults on officers by suspects also plummeted by nearly a third. To this day police uniforms cause debate. Some think they are too “paramilitarisitic” and others argue that more weaponry is needed to protect against an increasing amount of threats. Regardless of the viewpoint, it’s interesting to think about the fact that if the Union didn’t win, police might be dressed in a different color today. Previous Previous post: How many languages are spoken in India? Next Next post: Why Isn’t Fish Considered Meat During Lent?